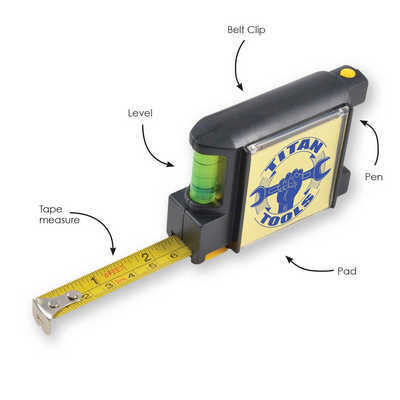 4 in 1 2 metre /6 foot tape measure. Also includes silver belt clip, yellow pen, yellow note pad, spirit level. Push button for tape measure release. Colours - Black/Yellow Size - 80 x 63 x 30mm (LxHxD) Decoration Area(s) - Pad Print : Front - 40 x 40mm (LxH). Price includes : 1 Col 1 Pos Print. Setup is included.